Combining the accounts of the several historians, we now know that when our Lord was given up by Pilate to the will of his enemies, the soldiers, as was the ordinary practice in regard of those sentenced to crucifixion, laid upon Him the cross whereon He was to die. After He had carried it a certain distance, the soldiers, for one reason or another, took it from Him, and placed it on a Cyrenian whom they happened to meet; and this Simon bore it to Calvary. We have no certain information as to who Simon was, whether or not a disciple of Christ. . . . The probability would seem to be, that he was at least disposed to favour Christ, and that this his disposition was matter of notoriety. Nothing is more likely than that it was on account of his attachment to Jesus, and for the sake therefore of exposing him to public ridicule, that the soldiers compelled him to carry the cross. . . . I could not spare this incident: it just serves to assure me of the bodily sufferings of Christ: it is to me what an extorted groan would have been, a decisive witness, that the marvellous patience of the Redeemer in no degree indicated that He did not feel in the flesh. For why is the cross taken from Him, and placed upon Simon? Because He could scarcely advance, so exhausted was He with what He had endured, and so oppressed by the burden. . . . . St. Paul, like Christ, was persecuted for righteousness' sake: like Christ, he submitted to persecution, for the purpose of benefiting others; therefore his sufferings might be spoken of as a part of that aggregate of woe, which had to be sustained in order to the salvation of the body, the Church. So that the representation of the Apostle in regard of himself; is precisely that which we might draw from Christ's last instance of symbolical teaching — the disciple bore the cross which his master had borne; even as that laid upon Simon, had been carried by Christ. . . . Be ye certain, then, not only that, if Christians, you must carry Christ's cross, but that you make it all the heavier by avoiding it when it lies in the clear path of duty. There is no such way of incurring shame as the being ashamed of Christ. . . . And yet even in his case, there is one other particular which should be noted for the comfort of the Church. 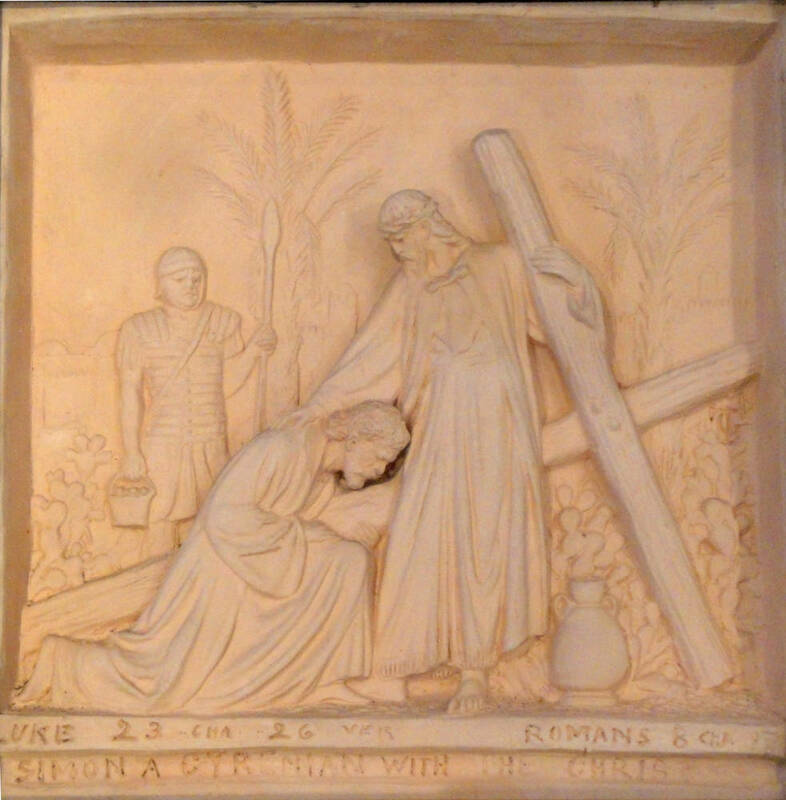 The cross was carried by Christ, before it was carried by Simon. Monkhouse, Cosmo. “Stories in Terra-Cotta.” Magazine of Art. 6 (1883): 340-44. Internet Archive version of a copy in the University of Toronto Library. Web. 5 September 2013.